A kitchen appliance designed to keep crackers, cookies, chips, and other crispy foods fresh and crisp. It will also restore the crispness to foods that have lost their crisp texture. It is an electrical appliance but does not have any settings to be concerned with, just plug it in and use it. 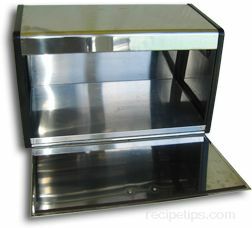 The brisker is similar to the size of a bread box. It is a great appliance to have to help reduce the waste of food because it keeps food fresh longer, especially in locations where there is a lot of humidity.